Will high-speed tube travel become a reality? 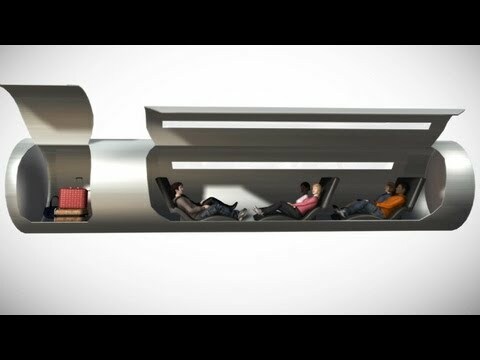 A cutting edge company known as ET3 believes the application of magnetic levitation high-speed tube travel will introduce society to an all new era of trade and tourism. Known as an Evacuated Tube Transport, or ETT, ET3 promises travelers could depart from New York and arrive in Los Angeles in just 45 minutes. In fact, an international businessman could potentially leave New York and reach Beijing in merely two hours. How is this possible? ET3 claims its ETT can reach an astounding top speed of 4,000 mph. According to illustrations and renderings of an early concept, the ETT will offer seating for six and accommodate cabin space for luggage. While the idea is ambitious and deserves respect, is ETT transport truly feasible to the multitude? What will 4,000 mph do to the human body? ET3 claims the ETT at max velocity will strain passengers by at a force of 1G, a force no greater than what passengers may experience in passenger vehicles. Beyond its travel efficiency, ET3 claims the ETT will be less expensive to build and operate than high speed rail and freeway. Finally, ET3 CEO and founder Daryl Oster hopes that the ETT will eventually boast intricate networks similar to freeways. Oster believes the ETT will play a key role in alleviating traffic congestion as well. Are you curious to learn more? Have a look at the radical ET3 ETT tube transport system by watching the video above. Would you be interested in boarding an ETT?